Do Du wish the 11th Doctor & Clara had lasted longer? Do Du think the Doctor loves Clara? Which episode did Du like them better in? [i]That night John lay awake in bed, thinking about all the different futures he could have and all that he had to do was say yes oder no. But the bigger issue was which women would be Von his side? Clara had tucked the children into bett and began to get herself ready for a nights sleep but she also had other thoughts on her mind. She wanted John to go to America, its what he's always dreamed but she didn't want him to leave without her. She knew that was selfish of her but it was how she felt. She looked out of her bedroom window and watched the sky, praying for an answer. As the afternoon approached, Clara was yet to hear from John which was unlike him. All she could think about was seeing his name on the document in Mr Robert's study. What does it mean? Is John leaving? She was so distracted she never noticed that Amy was talking to her. Amy could tell her governess wasn't herself. After everyone had retired to their rooms for the night, John slipped a note under Clara's door asking her to meet him in the lounge. He sat for a couple of Minuten with the feuer to keep him warm, thinking about what to say to her. He heard her footsteps on the staircase. She gentle pushed open the door. 'Hi.' She went and stood Von the fire. 'You wanted to see me?' He noticed her body was slightly turned away from him, trying not to make eye contact. After the game, John helped the children with their Musik lesson. Clara sat with Tim at the Piano while John helped Amy with her composed piece. After awhile Clara heard Amy playing, she turned round only to see it was John playing Amy's piece. The song was played with such precision and filled with so much passion. She fell Mehr in Liebe with Von the minute. After he finished, the room was left in a stunned silence. 'Is something wrong?' John asked, nervously. [i]After John had finished in the attic, he took the children outside and played hide and seek with them. 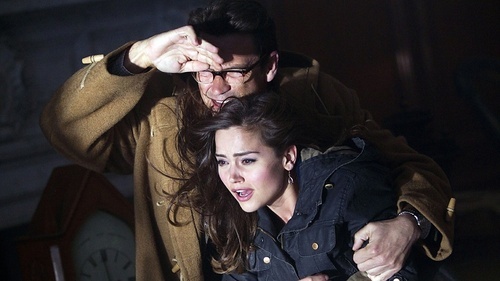 Clara decided to make it interesting Von blindfolding him. She tied a scarf around his eyes, spun him round a couple of times then told the children to hide. John got his bearings then began to, slowly, Bewegen around the garden. The three of them clapped, to give him an idea of how close he was. He made his way over to the hedge, where he found Tim. Tim then took his hand and helped guide him around. That night, Mr Roberts asked John and Melody to stay as it was getting late. They agreed and went upstairs to get comfortable. Clara lay Weiter to John and watched him sleep, he was so beautiful. She still couldn't believe what she was doing, if Mr Roberts found out that would be then end of her career. But none of that mattered right now. She leaned down and placed a light KISS on his lips then began to KISS his neck. The Weiter morning, Clara received a telegram form John asking her to meet him. She went and asked Mr Roberts if she could have a couple of hours off to go and meet him, he agreed. She picked up her hat on her way out and met him and the bottom of the road. 'Morning Clara. Shall we?.' She linked her arm with his and they made their way down the road. Thoughts on The Doctor and Clara?